A retirement home for sloths from zoos has been set up in Pembrokeshire. 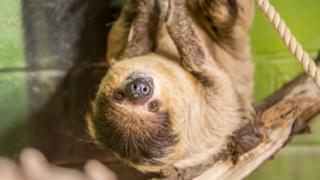 Instead of taking on young breeding pairs, Folly Farm has made the decision to home older sloths which have retired from other zoos. Folly Farm is now home to Tuppee, 24 and Lightcap, 34, who is currently the fifth oldest sloth in any European zoo. Zoo curator Tim Morphew said: "We're helping conservation efforts at other zoos by freeing up enclosures for younger, breeding pairs." Two-toed sloths have a lifespan of about 20 years in the wild but have been known to live up to 50 in captivity. They reach an average weight of 8kg. "Initially we didn't make a conscious decision to home older sloths," Mr Morphew said. "Conservation is key for us at Folly Farm and our breeding programmes are a huge part of that, but our older animals are just as important to us and we need to make sure they're looked after in their old age. "With the older sloths, we might boil their root vegetables to make them softer and easier to eat and, if they're showing signs of old age, add supplements like cod liver oil into their diet. "Depending on how they get on, we might also look at adapting the enclosure to make the floor deeper and reduce the height of branches, so they don't have as far to climb down." Tuppee was taken on by Folly Farm in March 2016 and his new companion, Lightcap, is the latest addition from Bristol Zoo. "Like many older men, Tuppee has been known to be a bit grumpy and even misbehaves at times, but we know he's a softie at heart," Mr Morphew added. "Sloths aren't known for being social animals, but as they get older we've found they do like company.